As moms we all face a similar struggle…finding a good sitter! Our wonder woman this week, Lynn Perkins, founded a site that many of you may be familiar with – Urbansitter.com, a website that helps you find great babysitters. The beauty of it? It recommends sitters that are somehow connected to someone in your social network, so it’s easy to quickly get a friend’s opinion. Think of it as digital word of mouth. Lynn tells us about how she’d love to be a first grader (for a day), why she is afraid of lice and how she came up with the idea to start the company. UrbanSitter is my third startup company. I have gone back and forth between tech startup companies and real estate development. While they may sound like two very different worlds, what I love about each of them is that you are building a product that will resonate with people and excite them. 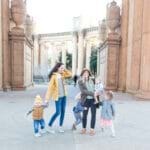 I started UrbanSitter because I felt that there needed to be a more efficient way for parents to find trusted childcare. As somebody who loves matchmaking, I was frequently introducing my mom friends to nannies and sitters. I realized that I could harness the power of a recommendation from a friend and combine that with an easy to use booking system. And from that idea, UrbanSitter was born. My alarm clock, otherwise known as my son, Ben, wakes me up around 6 am, then I hang out with one or both of my twins in my bed until it’s 6:30 or they have been loud enough to wake up my toddler. I quickly shower and get everybody dressed, fed, and ready for school, so that we are all out the door by 7:45. I’m most productive early in the day so I work non-stop through the morning. A couple times a week my co-founder and I workout at lunch, a great way to spend time with her outside of the office and it prevents me from making excuses not to go if we do it together. Weeknight evenings are usually divided between dinner with my family and work commitments. I then run around the house making sure homework, library books and school supplies are in the kids’ backpacks for the next day, before I crash on the sofa to finish work or talk to my husband. Tell us about a “save the day” moment. I like to think that UrbanSitter saves the day everyday. When a sitter tells me that they are finding more work through our site, and that they like the families they’ve met, I feel proud of the services we are offering to sitters. When a parent tells me that they had a relaxing evening out because they felt comfortable with the sitter they found on our site, it makes my day. I admire my business partners. They are superheroes – amazing moms and talented businesswomen. In true superhero fashion, we each have our unique strengths. As a team I think we are incredibly powerful, focused on propelling our business forward while building a fantastic company culture. Is forgiveness a super power? In the past couple of years I’ve grown to accept that I can’t get it all done, and that’s okay. I’m more forgiving of myself than I was I the past. Although I’m still running around and trying to do as much as I can at work and with my family, I don’t feel guilty when it doesn’t all happen. I’d like to be a first grader for a day. I’d spend the day at my sons’ school, seeing what they are like with their friends and teachers. When I ask them about their days I often get very short answers and it would be fun to see what really goes on. Plus, what adult wouldn’t want to have art and recess again? What is your arch nemesis? Lice. I say this half-jokingly. I was in the middle of an important meeting at work when I found out that my sons had lice. I had to leave and rearrange my afternoon to get them treated. My nemesis is really the unexpected obstacle—the problems that pop up unexpectedly and prevent me from getting it all done. It keeps me on my toes though! Right now I most identify with The Flash. Although I haven’t gained super-speed power capabilities I am usually moving quickly, whether it’s working at startup pace or flying between kids’ appointments and activities. The Flash also has the superpower of endurance, which most entrepreneurs and moms of young children possess. My main support is my husband Stephen, or as I’ll call him in Superhero terms, Superman. He’s in an office by day, in combat by night (not really but if you’ve ever tried to get twin boys and a toddler boy through bath and bedtime it can often feel that way) and he demonstrates a social responsibility to his community by serving on many local boards. Our sidekick, maybe she would be Robin, is our nanny Caitlin. Superman and I couldn’t do it without her. She completes our team by keeping our mini-superheroes happy and everything organized. Nothing makes me happier than hearing from local college students that they’ve been able to help pay for college, buy their first car, or save for the future because they’ve worked for families they’ve met on UrbanSitter. We are successfully developing a strong sitter community and I’m proud to provide them with job opportunities that they otherwise would not have found. To thank Lynn for her time we will be making a donation to Homeless Prenatal Program which offers services focused on housing, prenatal and parenting support, child development, family finances and stability, access to technology, domestic violence and substance abuse, family unification, and emergency support of basic needs. If you are in Chicago, we are hosting Babysitter Speed Dating with Urbansitter.com on July 15 at 7 p.m. Meet local sitters and get an exclusive discount for the site!